Real Life LEED: LEED-Schools VOC Requirements Simplified! 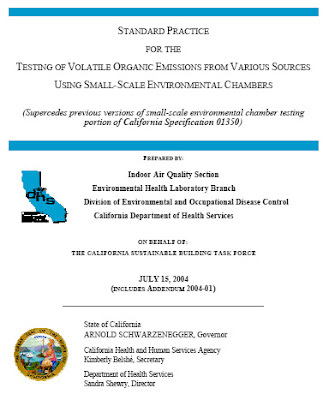 Those of you working on LEED-Schools projects may have noticed the incredibly vague referenced standard for all VOC levels in EQc4: California Department of Health Services' Standard Practice for the Testing of Volatile Organic Emissions From Various Sources Using Small-Scale Environmental Chambers including 2004 Addenda. RealLifeLEED strongly suggests throwing your "Standard Practice..." standard out the door and falling back on the slightly less confusing LEED NC 2.2 references as provided in the table above. You're allowed to do this thanks to a "PIEACP", which is not as delicious as it could be... It stands for "Performance/Intent Equivalent Alternative Compliance Path". Have some further insight to share about LEED-Schools VOC levels? Did you actually find products compliant with the original LEED-Schools standards (and manufacturers who could actually verify they complied)??? Let us know by sharing your experience via comments! There are actually a number of products that would have worked within the CHPS-based system. Unlike the USGBC, CHPS posts compliant products on their web site - probably because it costs around $3500 per product to have it tested. 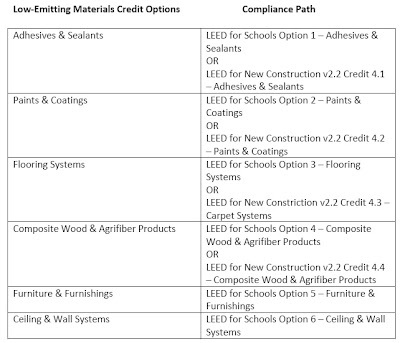 (http://www.chps.net/manual/lem_table.htm#paint) Thank you for keeping up on all the rule flipping at USGBC. We are a manufacturer of commercial interior paints (also USGBC & CaGBC members) and have a hard time wondering where our target is going to be each week. Many thanks for the heads up!!! This will undoubtedly simplify things greatly in the future. It amazes me that the reference guide would not send you here, or did I just miss the link? Do you know if the new LEED V3 has any changes to the options that were included in the PIEACP of July 2008 in LEED for Schools?